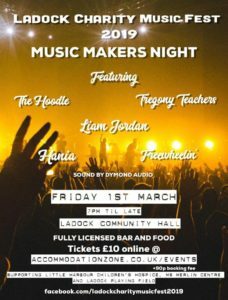 Friday night is Music Makers Night a selection of the foremost music talent in Cornwall. We are very privileged to announce the following acts. Last year we were disappointed the The Tregony Teachers AKA Andy and Jon were unable to perform. We are absolutely delighted that for 2019 they have agreed to add their amazing talent to the night. With a repertoire of over 4 hours of hits from across the decades, The Tregony Teachers aren’t to be missed. 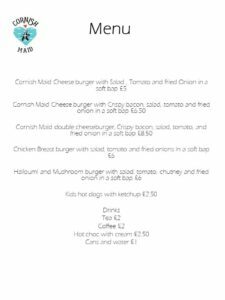 Whether you’re a fan of ACDC, AHA or Amy Mcdonald, we’ve got it covered! Next and new to the Ladock Musicfest is singer/songwriter Liam Jordan Music. 2018 has been an exciting year for folk-rock singer-songwriter Liam Jordan. Having released his debut album back in May, Liam has just finished a full eighteen city tour of the UK & Ireland to promote the record so it is a great honour to have him sing for us this year. The album fuses; folk, country, gospel and rock in a travelling blues band style format, forging strong subject matter with powerful and emotive production, and nodding a respectful head to songwriting greats such as Bob Dylan, Van Morrison, Bruce Springsteen and more recently, Jason Isbell. His first single ‘Tap At My Window’ was featured on Richer Unsigned’s ‘Best of June’ playlist in association with Q Magazine. Three of his album tracks have also had BBC Introducing plays and he is currently ranked #6 in the Reverb Nation UK singer-songwriters chart, #1 in the regional (Southwest), and #166 on their global singer-songwriter chart. 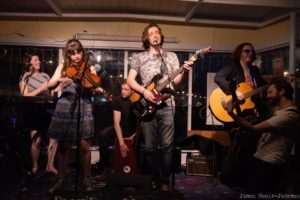 OUR HEADLINE ACT is The Hoodle – Country Rock/Country Blues/Americana quartet. 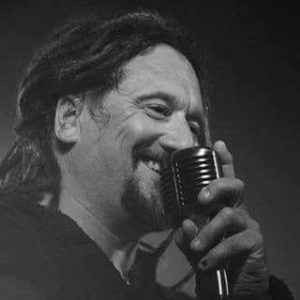 STEVE TURNER – ELECTRIC/ACOUSTIC/SLIDE/STEEL GUITARS, VOCALS: Started out playing cornet & bass with his Dad Ken Turner, musical director & dance bandleader at the Blackpool Tower Co. Played in various touring bands as a bassist, but after seeing Jimi Hendrix play live in 1967, was inspired to take up the guitar, becoming an accomplished slide, steel, electric & acoustic guitarist. During his touring & recording career, he has played with Kirsty MacColl, Ralph McTell, Pete Murphy, Lloyd Green, Billie Jo Spears, and the Bucket Boys with Willie Wilson & Tim Renwick, among many others. Syd Barrett, Hank Wangford, Al Stewart, Joe Brown, Ralph McTell & on various other sessions & tours. More recently, he worked with the Coyotes, an award winning country band, & theBucket Boys with Steve Turner and Tim Renwick. EMMA SPIRES – ELECTRIC/DOUBLE BASS, VOCALS: Studied classical guitar, then moved to bass. 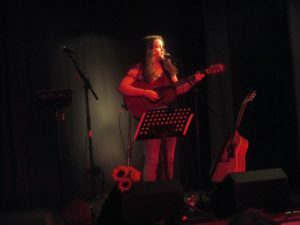 She has played on the Cornish music circuit since age 14, performing with bands of various genres including Country, Blues, Rock, Folk & Gypsy Jazz. 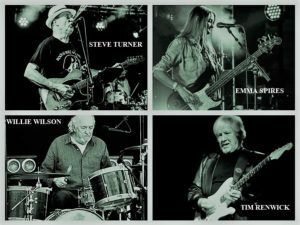 Emma was part of the band Blues Connection who played supports for Wilko Johnson and Little Feat. She has also played bass on three UK tours with Paul Barrere & Fred Tackett from Little Feat, along with Phil Beer of Show Of Hands. After over 5 years with the Hoodle she has also become an accomplished singer. 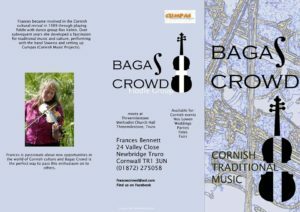 GIGS & PERFORMANCES – Mainly pubs & clubs, also various festivals & events throughout Cornwall, including support for Chantel McGregor. 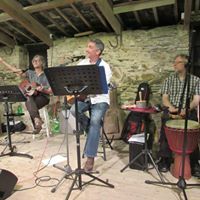 They have also played live on BBC Radio Cornwall & appeared on BBC Spotlight TV at the Royal Cornwall Show, Port Eliot Festival, Falmouth Oyster Festival, Celtic Beer Festival and many others. THE ALBUM – An Independent Blues Broadcasters Association ‘Pick of the Month’ for October 2017, “Spo-Dee-O-Dee” was recorded LIVE in one afternoon plus a few overdubs, with producer Simon Fraser (ex-Sawmills Studio) at his Woodside studios. 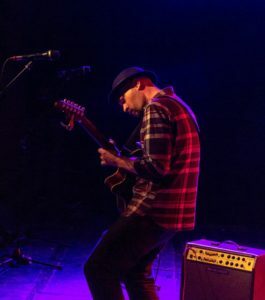 Long-time inspiration Albert Lee said when hearing the album, “Good rootsy stuff, with good sounds and classic tunes that are really well played”. Ralph McTell, who all the band members have played and recorded with, has been a long time inspiration & supporter of Hoodle gigs, and has championed the album “Spo-Dee-O-Dee” to many of his fellow musos, with great feedback. 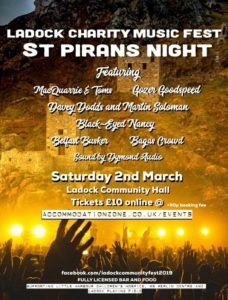 Saturday night is St Pirans Night of Song, Dance and Laughter with the best Folk and Cornish Music in the South West. We are proud to say that we already have a line up of fantastic musicians and performers who have reserved the date for us. MacQuarrie and Toms formed in 2014. Since then they have played throughout the UK and Europe. In 2018 the duo were featured artists at Festival Interceltique de Lorient, the same year that they also supported Fairport Convention as part of their 50th anniversary tour. Most recently the duo played with Welsh Folk Group Jamie Smith’s Mabon, to perform a commission piece to mark the 40th year of the Lowender Peran Festival in Cornwall. Since their formation the duo have released 2 EPs, both of which have featured on BBC Introducing and in 2017 they won the International Pan Celtic Instrumental Duo competition in Ireland. MacQuarrie and Toms aim to bring Celtic Folk music to a wider audience by combining traditional playing techniques with modern effects. 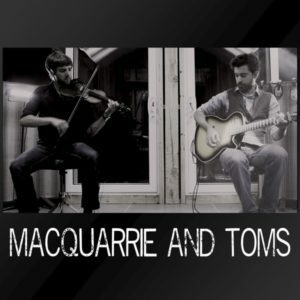 “Celtic-Cornish folk duo MacQuarrie and Toms, who have been performing together since 2014, arrive with their second EP Granite. Featuring two songs and four instrumentals it showcases the combined talents of Stuart MacQuarrie on fiddle and Jamie Toms on acoustic guitar. Sweet Nightingale is a charming rendition of a traditional Cornish folk song. Granite is the Hardest Stone, meanwhile, is the duo’s interpretation of a song by Chris Lethbridge, who wrote a number of songs inspired by the Isles of Scilly. 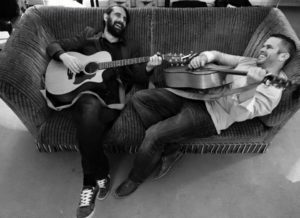 With the tunes the duo take an inventive and engaging approach, both with their own material like Toms’ Clutterbuck and MacQuarrie’s Bunch of Fives, as well as with their own interpretations of other writers. “MacQuarrie and Toms. It was these three magic words everybody was excited about last night. And I think that’s the best way to describe these boys. Magic. Or maybe “magic trick” might be more appropriate. How on earth they make the music they do with just two people is beyond belief. There was lots of moments where I am sure I was not the only one looking for the rest of the musicians on stage. The equipment surrounding them is the most I have seen in a gig. An amazing set of toys. No wonder they are labelled as “The future of folk”, they are surrounded by contraptions! And believe me, they used every one. And they pulled a lot more than a rabbit out of the hat! Cornish, Celtic and Irish tunes dominated each set but with their own unique delivery and skill. Both men are incredibly skilled musicians and it is of no surprise they are both teachers of their craft. They start off slow and beautiful and then out of nowhere surprise you and up the tempo. One of the many highlights for me from the first half has to be “Bottleneck Caravan”, written about a man with a large caravan going around the narrow winding roads of Cornwall, I won’t give away the punchline, but this little anecdote was a hit with the crowd as they went into play the tune. I was overjoyed to find this on their EP which was played as soon as I got home. The song perfectly captures this caper and helps you visualise the scene completely. The best thing about folk music is the storytelling. And what really impressed me was that these guys knew the origins and story of every song they played last night. You can see their heart, soul and passion goes into every performance. They write themselves and are so impressive, they enable music to just pour and flow out of them. They really made you aware that tonight was a special show, they weren’t using a tried and tested set-list, they were playing music they never have in public before. You could tell they were having fun and really enjoying themselves. They played an instrument that looked similar to an accordion like a piano, they played (I was waiting for this one) what looked like a close-up of the keys of an all-black piano. Something to do with bass to add to the song. This interesting bit of kit by the way Stu played simultaneously with the fiddle. At first I thought he was just tapping his foot to the music…he wasn’t he was playing this bass thing! To see MacQuarrie and Toms is to see a show. You are transfixed, you cannot stop watching them. There were a few times, the song was really fast-paced, and these guys kept completely in sync with each other, the exact same melody, the exact same time, on completely different instruments. Fast paced as well, remember. Their talent and ability is staggering. Their twist and ability to be so contemporary is fascinating. Their “Trip to Miriams” was another highlight. Partway through the evening, two girls got up from a table and began to tap dance to the music. A lovely surprise, and one the boys arranged for the audience. MacQuarrie and Toms are funky. They are extremely talented. They are original. They are showstoppers. In short, they are bloody brilliant! We are very humble to have new to the Musicfest some of the best folk musicians and performers in the South-West and beyond. Firstly the Belfast Busker has agreed to entertain us bringing the Irish connection to the celebrations. 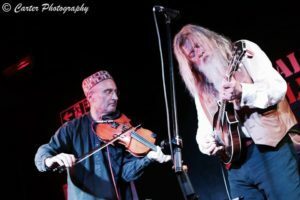 Singin’ Songs & Spinnin’ Yarns – Keltic Folk Rock. Sure to make you smile and get you dancing. Next we have Gozer Goodspeed all the way from Plymouth. A blues/folk singer/songwriter bringing to us his powerful, foot-stomping rabble-rousing performance together with his unique guitar skills. Lastly we have Davey Dodds and Martin Solomon half of newly formed The Porbeagles with Davey Dodds. Martin makes magic with his fiddle and Celtic harp and Davey Dodds is a songwriter of some renown. His classic ‘The Magpie’ was recently covered by The Unthanks and used in the BBC2 series ‘The Detectorists’. Great Musicians. What an amazing collection of talent worthy of a full house. Both main acts, The Hoodle and Liam Jordam have now pulled out of this event tonight. Also now the organisers have this morning informed me there will now not be any food or drinks available either. It is now all a bit of a shambles really and as such, I therefore formally request a refund of my 2 tickets, direct to the card on which they were paid for.